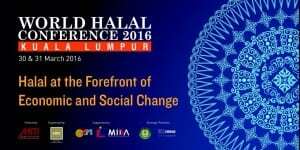 Kuala Lumpur, 4th April – More than 1000 delegates converged at this year’s 9th annual World Halal Conference. Centred on the theme, ‘Halal at the Forefront of Social and Economic Change’ the conference gave way to empowering insights and sound knowledge of the Halal industry. The event was graced by YAB Tun Abdullah Haji Ahmad Badawi, the patron of World Halal Conference who gave the opening remarks during the conference. A main conference was also hosted with a Ministerial Panel chaired by Yang Berhormat Dato’ Sri Mustapa Mohamed, the Minister of International Trade & Industry Malaysia, a Global Leaders Panel Session, several concurrent plenary sessions on specific components within the halal eco-system, e-commerce, youth and women’s empowerment and a Business Networking Galleria by collaborating partners of WHC. “We are honoured to see such strong commitment from our industry partners, together with the participation of foreign delegates and renowned speakers who have made this year’s conference a success. We urge for their continuous support; together we can take the Halal Industry to new heights, both internationally and locally,” said Tan Sri Dato’ Dr Syed Jalaludin Bin Syed Salim, Chairman of the Halal Industry Development Corporation. “Indeed the Halal Industry Development Corporation has grown by leaps and bounds since its foundation 10 years ago; it is of utmost importance that we sustain the Halal momentum and drive its growth even further,” adds Jalaludin.